The article is a personal reflection on diary writing. Barthes initially confesses that he never wrote a diary and was not sure if he should do that, as diary writing accompanies “an indispensable doubt in what we write in it”. Thus, he finds only a literary justification for any diary and lists its four possible motives: poetical (revealing the author’s handwriting), historical (discerning the traces of an epoch), utopian (knowing the intimacy of the writer), love (polishing the accuracy of expressing). The question asked by Barthes if he should keep a diary is connected with a more important question: can one make a diary a work? Consequently, Barthes quotes two samples of his diary to return at the end to the problem of literary status of a diary. For Barthes, the status in question is ambivalent: due to its austerity, a diary has an unstable form, so it is not a text, but simultaneously it is a form in the making, it is a germ, a scrap of a text. As Barthes sees it, one cannot overcome the ambivalence since it would result only in “overworking” the diary to its death, but then it would stop being a diary. Philippe Lejeune’s paper is an analysis of a personal diary with regard to the categories of continuity and discontinuity. Initially, Lejeune considers not only two typical diary mediums: a notebook, which gives continuity to the subsequent notes, and loose pieces of paper, which – conversely – are a material sign of a diary’s discontinuity, but also exceptional cases of continuity and discontinuity of notebook series or agenda notes. Then Lejeune points at the necessity of examination of a diary’s rhythm, which is the frequency of notes additions (together with their length) in reference to historical time. He suggests his own, short definition of a diary as “a series of dated traces”. In the following part of the paper Lejeune regards a diary as a kind of “activity” and not a “product”, and discusses the reasons and the significance of the breaks in diary writing, i.e. the discontinuity of notes additions. Finally, Lejeune presents two interesting diaries as regards time construction: by Pierre-Hyacinthe Azaïs (1766–1845) and Claude Mauriac (1914–1996). The former was writing his diary for 34 years in 366 different files and added the subsequent notes using the same date but a year before. The latter, after a few dozen of years of diary writing, started composing further volumes by contrasting his notes written in different periods. In this way, as distinct from Azaïs, Mauriac transgresses the chronological continuity of a typical diary. The article proposes an analysis of the diary through the prism of a conception of the diary in which it is treated as an everyday writing practice – acting in words – according to which the newly composed text is only one element of it; the remaining elements are performative-functional (the place the diary occupies in the writer’s life and its functions) and material (the diary’s carrier, its material structure, appearance). Using the three categories (practice, material, text) the author gives a thorough characteristics of personal diaries, every time paying special attention to the peculiarity of writers’ diaries. Light is shed on the important role of motivation for diary writing and on the function the diary performs (e.g. recording one’s writing, a chronicle of a creative work, the writer’s creative workshop, l’atelier d’écriture, creative archive, autotematic, self-critical and critical practice, creation of a literary text). The author pays attention to the function of a diary carrier (e.g. notebooks, loose pieces of paper) and to an important practice of rewriting and amending of notes in some writer’s diaries – an evidence of changing a personal writing into a literary text. The author suggests his own typology of writer’s diaries comprising private diaries, writing diaries, and literary diaries. The present article is an attempt to interpret Tyrmand’s Diary 1954 with the use of Mikhail Bakhtin’s carnivalisation theory. The relationship between Diary and the reality created by social-realist texts can be put into the scheme carnival – the official culture. The literary exponent of this relationship is the grotesque, with which Tyrmand transforms the elements of the official culture. In a totalitarian country, an open criticism of the system was impossible, thus only in his Diary could Tyrmand deride with impunity the communism and the ruling party. He did that through the carnivalisation of the world presented, which related to profaning and degrading of the social-realistic sacrum. Diary writing was also linked with a katharsis that Tyrmand experienced due to the carnivalistic laugh. The theory of carnivalisation makes it possible to delineate the so far unknown elements of Tyrmand’s prose. The present text is an attempt at a comparative analysis of the two existing versions of Leopold Tyrmand’s Diary 1954: the original 1954 version, and the revised by the author issued in 1980; it also questions the identity of those texts. The first part of the paper is a summary comparison of the two aforementioned versions, mainly as far as formal changes and additions of fragments absent from the first version are concerned. In the second part of the paper the author tries to establish the identity of the text as confronted with the form of an intimate diary, being – roughly speaking – the first version. The main concern here is the problem to which extent the 1980 version is a diary and to which a novel in the form of a diary, and if there is only one text in two versions or two separate texts using the same plot. The author of the paper also endeavors to reconstruct the writer’s strategies that lead to transformations of the text’s substance aiming at creating Tyrmand’s self, increasing the communicativeness of the text, making an evidence of his presence in time, and turning the diary into a type of autobiographical synthesis. As far as the identity of the text is concerned, the author of the text claims the 1980 version to have a hybrid form and puts forward two terms to define it: “ironical poem” and “diary as encapsulated autobiography”. Maria Kuncewiczowa’s letters to her husband analysed in the paper constitute an interesting source to penetrate a difficult from many reasons period of her emigration life in England and in the first months of her stay in the USA. The letters in question also facilitate a better comprehension of her tests such as The Conspiracy of the Absent, The Forester (to a smaller extent), Thank you for the Rose, The Olive Grove. They are also a contribution to the understanding of a writer’s situation, who – when emigrated – does not want to stop her literary activities. The last postcards from this collection come from the year 1958 and refer to Kuncewiczowa’s first after 1939 stay in Poland. The letters constitute an interesting counterpoint to her autobiographical relations as seen in for example Phantoms or Nature, since they show Kuncewiczowa not only as an artist living mostly in a phantom dimension, but a person struggling with a burden of everyday life imposed by a necessity of political choice to live abroad. The present sketch (Decadence lost) is an attempt at “a new look at Sienkiewicz” that Julian Krzyżanowski called for as early as in the mid 50s of 20th century. The novelty of this reading relies mainly on rejecting the common schemes of interpretation, being many a time harmful for the author of Third One. In this case the author focuses on the figure of Leon Płoszowski (Without Dogma) and analyses the problem of the protagonist’s decadence, which is not as unambiguous as it was previously thought. The text is an attempt at reading Kazimierz Brandys’s prose from the perspective of two Jewish motives present in it. The considerations, based on analyses of fragments of the text, concentrate on the traces of Jewish origin in Brandys’s autobiographical discourse. They also focus on Brandys’s construction of protagonists, trying to find a place for a Jewish tradition in the shaping of a subjective self both in the “I” in the text and in the biographies he constructed. The self is based on a difficult coexistence of the sense of Polishness and of belonging to Polish intelligence alongside the Jewish nation. The latter is built mainly of the negative, difficult experience. What links Brandys with the Jewish nation is the stigmata, persecution and humiliation. A memorable experience in thus formulated sense of the national self is the Holocaust, and a Brandys-like protagonist construction: a witness, who avoided extermination, but was forced to see the suffering of others. This, in turn, resulted in his painful feeling of guilt and condemned to constant returns in his memory to the difficult experience of war. The article is an attempt to interpret Andrzej Stasiuk’s Dukla and Logbook, an attempt to grasp and to subjugate the loose notes taken out of the memory. The books in question are joined by the protagonist-narrator, who proves to inhabit the same place, spends his childhood in Warsaw, sees the world in the same way and is a keen on traveling. The article presents the characteristics of the protagonist, his labyrinthine travel in time and space, during which he tries to reach the successive centers and to find answers to questions on the condition of a man and the world that he poses to himself. It also pictures the world of the protagonist and discusses his struggles to describe and arrange the labyrinthine reality. The author also gives a characteristics of this “labyrinthine” composition and a vivid description (painting with words) used by Stasiuk. The construction of this article is considered to be the first level of the an in-depth analysis the author is conducting. Blogs – Internet journals – as a new and expansive phenomena and a demonstration of contemporary writing creativity constitute an interesting, but still undiscovered field of research for a literary scholar. The present paper encompasses such issues as uniqueness of the Internet as its transmitter and its impact on the shape of the blog, and the complex relationship between a personal diary, a silva, and a blog. A separate issue of the author’s reflection is the status of the author and the protagonist of a blog, and the anonymity that stems from it. The article attempts at a classification of blogs in the traditional genealogical paradigm. Moreover, the author touches the issue of the literacy of blogs, their published versions, and exploits the problem of seeing the “I” in blogs and its condition in the world, where all seems to be already written, recorded, and repeated. In his Dismissal of the Grecian Envoys Kochanowski put five speeches, after hearing of which the Council decides upon the outbreak of the war. A rhetorical analysis of those speeches and the comparison of the model of proceedings made up by Kochanowski with a real picture of the Polish Seym orations points at many similarities. They made the then receivers notice dangerous analogies. As a result, Dismissal […] became a warning against a destructive state of affairs for the nation, which, when exposed to demagogy, could not be prevented by the democratic system. Nevertheless, the Trojan proceedings were devoid of some – in the eyes of the nobility – key rules of the Polish Seym. They were: the importance of the constituted laws, the responsibility of the representatives before the nation, and a relatively high position of the king. Thus, the warning became a postulate on the special concern on our anchors of the political system that lacked in Troy. 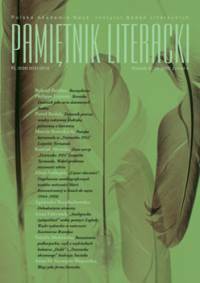 The article presents the English translations of three Norwid’s poems: Śmierć, Do Zeszłej… and Finis, which were made by a group of students specializing in translation studies at the Catholic University of Lublin. The group under the leadership of dr Brajerska-Mazur used the method of “katena” (adapted from bibliology) in order to discover the most significant features of the original poems and to render these features in their translations. The analyses of the original poems were always the starting point of their work. Thus, they began translating from the examination of a given Norwid’s poem using its interpretations and critics’ commentaries. The translations themselves were neither analyzed nor evaluated in the article. Dr Brajerska-Mazur only enumerated some of the problems and translation peculiarities encountered by the group during its work. Wherever possible she also compared the translations made by her group with those by Adam Czerniawski. Nonetheless, she left the evaluation of their quality to the readers.